Remote meter reading has become easier than ever before with the release of four new receiving devices from B Meters. These new devices are designed to work in conjunction with M-BUS modules installed on your meters, sending you vital information in the format best suited to your needs, commercial or personal. MWA is proud to have these new devices ready to ship for next-day delivery. Each provides a different and valuable service for easy and convenient reading of water meters, heat meters, heat cost allocators and temperature sensors, in accordance with the WMBUS standard. Best of all, these meters can be read with B Meters’ new reading system, which only requires a one-off software licence. Those unduly expenses that pop up every year are no longer the only option for remote meter reading – you can now get all of the information you need, at a fraction of the cost. The RFM-RX2 M-BUS receiver is a simple USB option for remote meter reading via desktop or laptop computers. Used in conjunction with B Meters’ meter reading software, the RFM-RX2 collects data transmitted by your B Meters wireless modules, displaying the information in a convenient format that is accessible 24/7. The device is equipped with a 360° orientable antenna that is designed to be easy to remove and replace if needed. The RFM-RBT Wireless M-BUS receiver is a lightweight and user-friendly option for wireless smartphone meter reading. The RFM-RBT converts data transmitted by your B Meters wireless modules into a format readable by a free Google Play Store app. This allows you to view your meter information and save it directly to your phone for future reference, or even send it to your email address. For meter reading over longer distances, you can extend your range with the M-Bus RFM RPT3 wireless signal repeater. This device receives data transmitted by your B Meters wireless modules and repeats it, creating another access point for your wireless meter readers. The RFM-RPT-3 can be set with a daily activities window, inside which it performs the repetition of WMBUS telegrams in accordance with the requirements of the EN13757 standard. 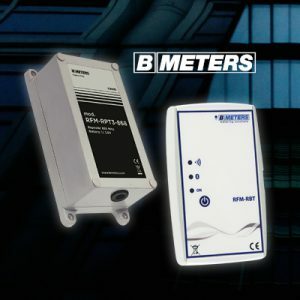 For long-distance automated transferral of meter reading data, the RFM-3 is a device that acts as an information gateway for your wireless B Meters M-BUS devices. After collecting and concentrating the necessary data, the RFM-3 sends it to up to 5 different email addresses via email using the GPRS network or, alternatively, an Internet connection via Ethernet/LAN/Wi-Fi network. The email contains the file with the acquired telegrams in .txt format and can be set to schedule automatically on a daily, weekly or monthly basis. To configure the device, use a LAN cable to connect to the Ethernet port of the RFM-C3 concentrator to a PC. Order your meter reading solution through MWA today! See all of the RFM range of receivers here. You can connect directly to our Sales Manager, Matt Rose on LinkedIn.